This 8th Generation Fanless PC has moved fanless performance into new territory. The 4-core i3 CPU has performance levels similar to our previous i5 product, and this is achieved using less power and generating less heat. This model features the Gigabyte GA-IMB310TN embedded motherboard featuring fast DDR4 memory, mSATA SSD, dual intel gigabit LAN, 3 video outputs (Displayport, HDMI 2.0, VGA Port). Other features include optional dual band Wifi, Bluetooth 4.2. The VGA Port can be replaced with a COM (RS232) Serial Port. The CPU is directly attached to the aluminium case. The design enables the product to not need air vents and enables it to be used in dusty/dirty environments. The internal SSD is thermally attached to the case using an aluminium block enabling it to be used intensely without any thermal throttling. Because there are no moving parts and no air sucked into the case the product has zero maintenance and high reliability. You really can now have everything... computing power, small dimensions, low power consumption and silence. It is easy to add extra storage. You can add 2 x 2.5" SATA drives (SSD or HDD). RAID modes are not supported. The high performance levels are maintained even when the product has been heated from extensive use. There is no throttling of the CPU or overheating. 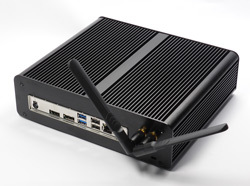 The PC can be used for everything from a business control PC, file server, office work or general home PC, or as a media centre connected to a LCD TV set using HDMI. *1: Tested at room temperature of 22°C with Passmark Burn-in test with 100% CPU. We can configure this unit with up to 32GB DDR4 Memory and 1TB mSATA SSD and 2 x 2.5" SATA drives (SSD or HDD). Please contact us if you want a custom configuration not available in the options. We can also pre-install with Windows or other Operating Systems.